5.0 earthquake hits Oaxaca, Mexico. In the Southern Hemisphere: Tropical cyclone (tc) 11s (Riley), located approximately 475 nm west-northwest of Learmonth, Australia, is tracking west-southwestward at 11 knots. Argentina; Summary – In early 2019, heavy rain caused flooding in the provinces of Chaco, Corrientes, Santiago del Estero, Tucumán, Santa Fe and Entre Ríos. At the national level, 4 people have died, more than a third of the impacted provinces’ population had to be evacuated and 30,041 people are reported to have been affected by the rainfall that began in the early morning hours of 8 January 2019 and lasted through 18 January 2019. On 23 January 2019, the Argentine government declared a hydro-meteorological emergency for the province of Chaco. Sinkholes and fissures are opening up the earth around Tehran, Iran’s capital city. And they threaten people’s homes and the local infrastructure. The ground is cracking open, thanks to a water crisis that has deepened as Tehran’s population has ballooned. The region is in the midst of a three-decade-long drought and ongoing desertification. The problem has been compounded as the city’s population has grown to close to 8.5 million. Water pumped from underground aquifers has gotten saltier every year as the city has increasingly relied on these underground water sources as opposed to rainwater. At the same time, a great deal of the dwindling water supply gets diverted to thirsty and inefficient agriculture. As a result, land in the area is physically slumping in on itself. 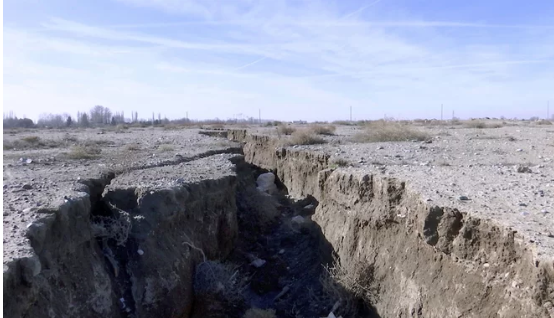 The ground around Tehran, sitting 3,900 feet (1,200 meters) above sea level, has subsided an average of 8.6 inches (22 centimeters) per year based on satellite measurements. All that subsidence has cracked buildings and water pipes, opened holes in the drying earth, and caused miles-long fissures. Residents fear their buildings collapsing, Nature reported. The airport, oil refinery, highways and railroads in the area are all threatened. In a follow-up on the measles outbreak in Madagascar, the outbreak case count has risen to 28,747 since early October. The vast majority of the outbreak cases have been reported in children. Of this total, 80 fatalities have been reported. Twelve confirmed human yellow fever cases have been reported in São Paulo State, including six fatalities, according to the PAHO. Cases have been reported in the municipalities of Eldorado (9 cases) and one each in Jacupiranga, Iporanga, and Cananeia in the southern part of the state.